It’s April! For many of us, that means spring is in the air. It means we feel the sun beaming on our face, our bare arms are kissed by the gentle breezes, our heads don’t need hats to stay warm. Does that mean the knitting season is over? It almost feels that way, doesn’t it? Few people need scarves or hats or mittens from us now. It’s barely even blanket season. But in just a month or two, two more seasons will be upon us. It’s true! At the beginning of summer is when intrepid high school and college seniors have finally been freed. And it’s when couples in love prepare to tie the proverbial knot. For us knitters, it means that — hallelujah — knitting season is definitely not over! These high school seniors preparing for college need us. Those college seniors about to join the “real world” need us. And those married-couples-to-be? They most definitely need us! To me, the perfect gift is a pillow. Dishcloths and towels are fine, but they’re almost too practical — not a lot of romance there. Blankets are wonderful, but they’re also pretty time-consuming! Knitting patterns for pillows hit the sweet spot. They’re practical but not too practical. They take some time but not quite as much time as a blanket. And because they’re a lot smaller than blankets, you can really have some fun with them. Check out the following free knitting patterns for pillows and find out just how much fun! Sternkissen Asterisk: Twinkle, twinkle, little star, how I wonder how to knit you into a pillow… this pattern shows you how! It’s available in both German and English. Goodnight Moon: Goodnight sun, goodnight moon, goodnight cow jumping over the moon… all this cuddly, adorable pattern needs is a cow! This pattern might be more suited to a baby than a graduate or a newlywed, but it’s so precious I had to include it. eReader Pillow Prop: This pattern is so clever, I want to make it for myself! 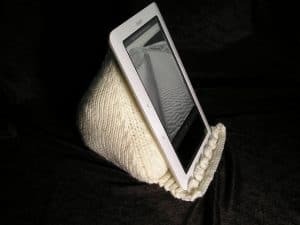 (And then maybe I’ll make more, haha) It creates a delightful pillow is perfect for laying against your legs and propping up your eReader, tablet, phone, 2-in-1 laptop, or any other sort of lightweight electronic device. Knit Pouf: You will need a fair amount of super-bulky yarn for this one. But there’s no arguing with the results! This pattern makes a big, luxurious “pouf” that you can snuggle into cozily. You can stuff it with either old pillows or old worn-out duvets or bedspreads or blankets. Tooth Fairy Pillow: Like “Goodnight Moon,” this is probably not appropriate for a graduate or a married couple (I hope not, anyway!). But c’mon. It’s so cute! Celtic Knot Pillow: For the Celtophiles in your life, this pillow is perfect! You’ll knit a long tube, stuffing as you go, and once it’s long enough, you’ll twist it into a knot. Makes a stunning piece for any home. Union Jack Pillow: And here’s a pillow for the UK folks (or Anglophiles) in your life! This pillow makes a great introduction to intarsia, in addition to being utterly stylish on its own. Thanks to these knitting patterns for pillows, I hope you’ll never again feel unneeded when springtime approaches! Previous Post: « Who Wants to Help Warm Canadians in Need?